“Lottery Day” is a party with a guest list of nine. Mallory (a sizzling J. Nicole Brooks) has invited them to her back yard to celebrate, but no one knows what the occasion is. 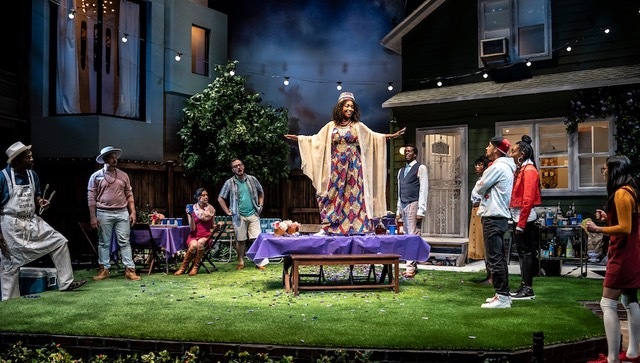 With a rich and complex web of characters, Ike Holter’s play at Goodman Theatre brings together the threads from the other plays in his seven-part Rightlynd Saga. Skillfully directed and choreographed by Lili-Anne Brown (with Breon Arzell as assistant director), “Lottery Day” reminds us that Rightlynd, Chicago’s fictional 51st ward, is all about what’s right and wrong with our city. Our mayor-elect and other members of our new city administration should head down to Dearborn Street now before their first council meeting. It’s Rightlynd, after all, a gentrifying neighborhood, where the old and the new clash on sidewalk and storefront. Mallory’s large house, the site of many past celebrations, is the last one on a block that’s being “revitalized.” Representing that trend is neighbor Vivien (Michele Vasquez) whose next-door home is a modern slab with floor-to-ceiling windows. Tori (Aurora Adachi-Winter) is busily organizing everyone, including handing out name tags. You’ll remember her as the hyper-organized stage manager in Holter’s “Red Rex“, recently at Steep Theatre. Nunley (Tony Santiago), proprietor of a Rightlynd store that he’s trying to keep going, pulls in a thread from “The Wolf at the End of the Block“, the Holter play staged by Teatro Vista. Both Zora (Sydney Charles) and Robinson (Robert Cornelius) have a connection to “Rightlynd“, the first play in the saga. Tommy Rivera-Vega plays Ezekiel, a wannabe rapper and poet, with the necessary high energy. This review was previously posted on Third Coast Review.